In the challenging world of conservation, our need for help is great, and community members respond eagerly to our calls for assistance. Conservation leaders engage the service of many volunteers, interns and coworkers, who vary in experience, age and expertise, but may not realize their role as mentors to them. What is mentoring? How can conservation leaders serve as mentors without being overwhelmed? Mentoring is dynamic, rapidly transitioning from traditional models of expert-novice dyads which “mentor at” to collaborative, mutually beneficial networks of “mentoring with” our partners. Given the diversity of our collaborators, this contemporary approach appropriately benefits everyone and utilizes our limited resources effectively. Participants in this workshop will explore how mentoring differs from supervision or training, what mentors and mentorees can offer one another, and how to develop effective mentoring networks, then discuss their own mentoring opportunities, challenges and needs. Participants will receive materials to take home. Dr. Hunt has worked in diverse terrestrial and aquatic ecosystems in Oregon, California, Texas, Arkansas, Kansas and Michigan studying vertebrate ecology, landscape ecology, and restoration. She collaborated with faculty in Nicaragua to infuse research-centered approaches into their ecology, environmental science and ecotourism curricula. 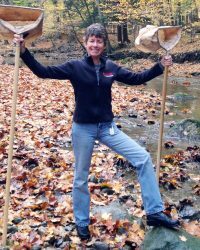 An educator for more than 30 years, she teaches courses in environmental science, ecology, evolution, agroecology, and animal behavior at GVSU, specializing in interdisciplinary courses that explore complex topics through diverse lenses. She loves working with students and members of the community and mentored her first undergraduate while a graduate student. She has collaborated with more than 60 undergraduate researchers and mentored many more. She participated in the dynamic meeting that led to the founding of the West Michigan Conservation Network, served on its Steering Committee, presented at the first Stewardship Network Conference, and continues enthusiastically participating in the Stewardship Network.